I also have many younger friends, people still in their prime and just starting their careers. They’re many decades away from retirement, and they’ve fallen victim to the mindset of those with whose career horizon stretches out far into the distance. Although they “Talk” about investing for the long term , their actions…lavish spending.…living paycheque to paycheque, ignores the future that will soon become their reality. I do not agree with you. It is never late to start saving and plan your retirement . “It is too late and I can’t do my retirement plan now. I will try to face my retirement as and when it comes” is not the right attitude. Anyway you need to face your retirement. You can’t skip or escape. So why don’t you prepare yourself now itself. However just procrastinating only further complicates your retired life and you may need to meet a lot of disappointments. This could be an overlooked fact, as old age meant more medical expenses and expenses on annual check-ups. In addition, there could be a need for long term care in hospitals and homes that could drain off a huge sum from your retirement corpus. A family history of disorders like diabetes, hypertension and cancer could increase your risk for these disorders further. Your employer may not provide medical aid after retirement. So instead of relying only on your employer provided mediclaim policy, it is advisable to take an independent mediclaim policy when you are young and healthy. I would always consider extremes in spending habits as unadvisable; being neither frugal in expenses after retirement nor too lavish to deplete all your savings within the first few years is advised. You have a right to enjoy a relaxed and comfortable time after retirement, but spending lavishly would only upset the amount of retirement corpus making you give up on even necessities in later years. It seems sensible thinking that old age could deter ones health to enjoy in later years and so enjoying in the first few years is sensible. Careful financial planning with projected living expenses and other considerations like savings, other social security benefits and pension would help. Your retirement corpus and retirement income need to be tax efficient. Suppose of you are choosing fixed deposit as an investment vehicle for accumulating your retirement corpus, then, you need to pay taxes as and when the fixed deposits matures irrespective of that you withdraw interest or reinvest under a cumulative option. But you need to pay tax only when you withdraw from the mutual funds. Careful selection of investment vehicle can reduce your tax during the accumulation phase as well as during your retired life. Be careful to avail of all these opportunities and invest the saved amount to build up your retirement corpus. 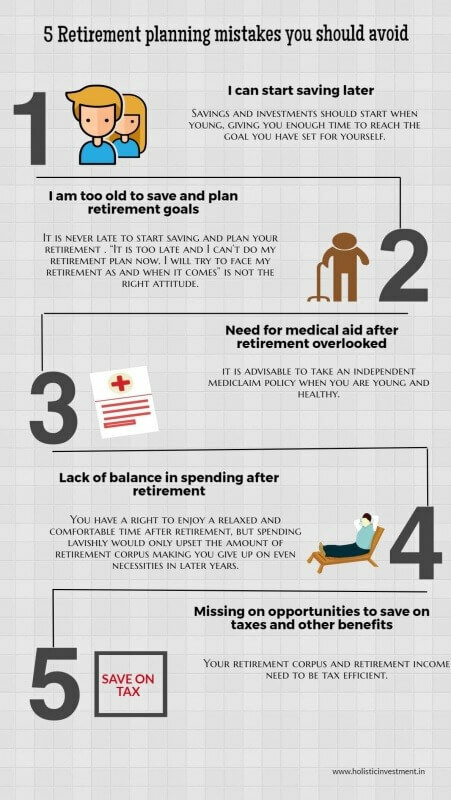 I am sure you have already started giving a deep thought to avoid the 5 bad choices that can ruin meeting your retirement corpus and having a relaxed retirement.